It's not just on the track that Morocco is aiming to become a world leader in renewable energy. As well as a host nation of a Formula ePrix, the country is also home to the world's largest concentrated solar farm. Built on an area of more than 3,000 hectares in area - the size of 3,500 football fields -- the Noor-Ouarzazate complex, produces enough electricity to power a city the size of Prague, or twice the size of Marrakesh. 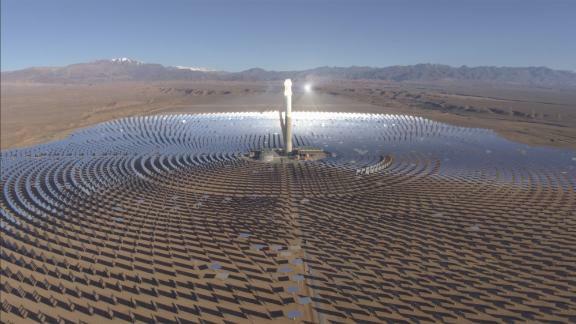 Situated at the gateway to the Sahara Desert, the whole complex provides 580 megawatts -- saving the planet from over 760,000 tonnes of carbon emissions. Unlike conventional solar panels which deliver energy direct to the grid, curved mirrors concentrate radiation to heat tubes of fluid which are pumped to a power unit. The unit holds the energy for use at a later time -- specifically at night when demand is greater. Imported fossil fuels currently provide for 97% of Morocco's energy need, according to World Bank . As a result the country is keen to diversify and start using renewable energy. "Morocco is an emergent country," Yassir Badih, senior project manager at Masen told CNN. "Electricity demand has doubled since 2010 and by 2030 we want Morocco to be one of the first countries in the world for renewables to exceed share of fossil energy." Beijing Daxing: The world's next largest airport?